Prytz Family: Finally a non-travel post! This blog has become a travel blog instead of a family blog. I've been a widow for three years and I've been traveling a lot, recently, so that's become the focus of my posts. 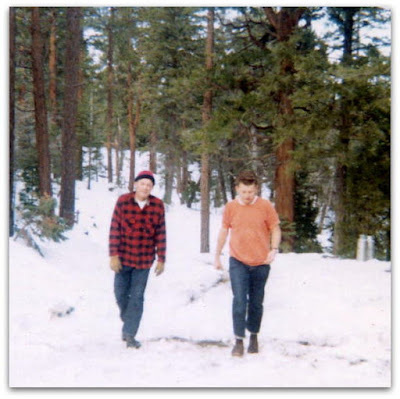 Today I was going through some photos and I thought I'd share one of my favorites, This photo was taken 54 years ago, a few months before I was married, at Boy Scout Winter Camp in the nearby San Bernardino Mountains. It features my two favorite men, my dad Rex, and my husband Bob. My Dad passed away 16 years ago, in January, and Bob passed away 3 years ago today. I'm lucky to have had a great Dad and husband, not perfect, but great.